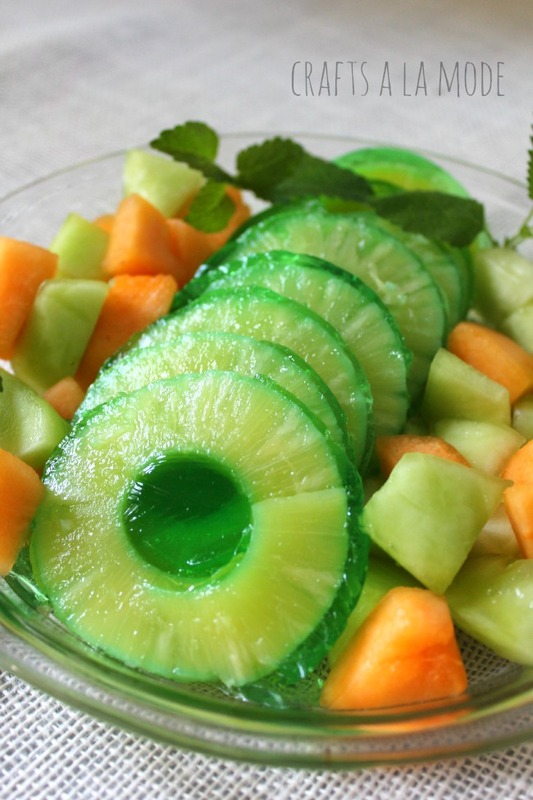 This is the easiest fruit and Jello (that's the surprise) recipe in the world. 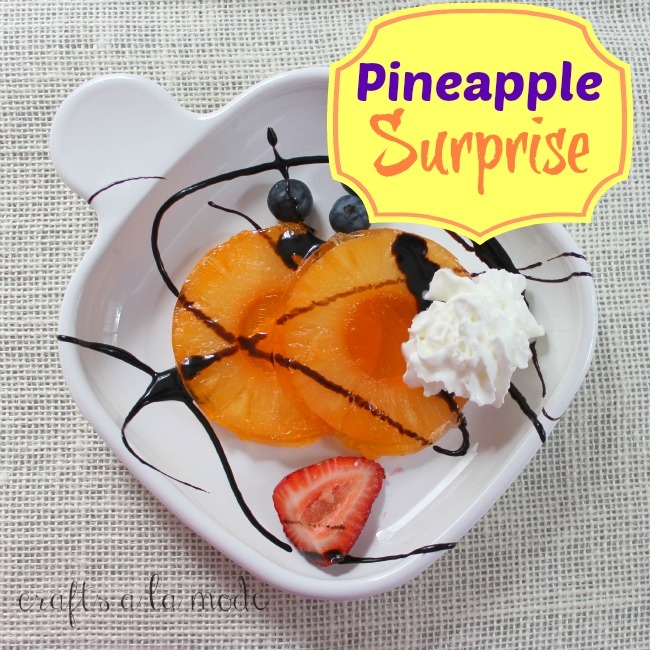 The fun part of this is that you use the pineapple can itself as the bowl for making this fruit and Jello dessert. I can't wait to take this to a summer picnic!! Believe it or not the extra unflavored gelatin in this recipe makes this dessert very sturdy. I couldn't resist making up a cute plate ... isn't it sweet? In 1/4 cup cold water dissolve the unflavored gelatin and set aside. Pour the package of Jello into a medium bowl and add boiling water. Stir. When all is dissolved stire in cold water. Stir in half of the unflavored gelatin. (I made 2 pineapple cans - one orange and one lime so I put half the unflavored gelatin in the orange Jello bowl and half in the lime Jello bowl. Stir well. Pour over the pineapple slices that are still in their original can. I tried to "center" the pineapple stack so that there would be Jello on all sides of the pineapple slices. 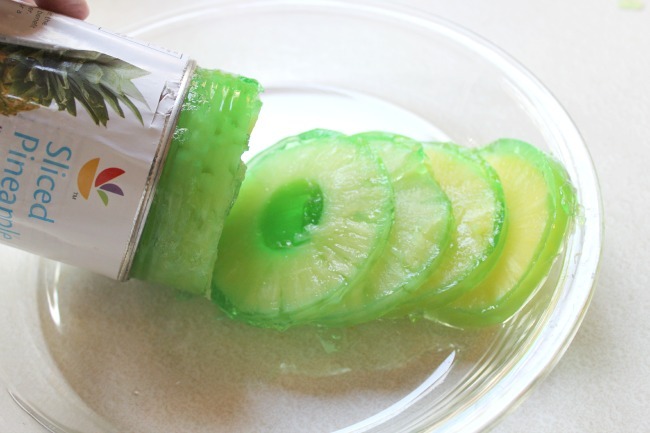 To unmold this Jello Pineapple... I take a knife and dip it in hot water and go around the inside the can to unseat the Jello. I also dipped the can in hot water (not boiling) for 2 or 3 seconds - just enough to melt the Jello so that I could coax it out of the can gently. 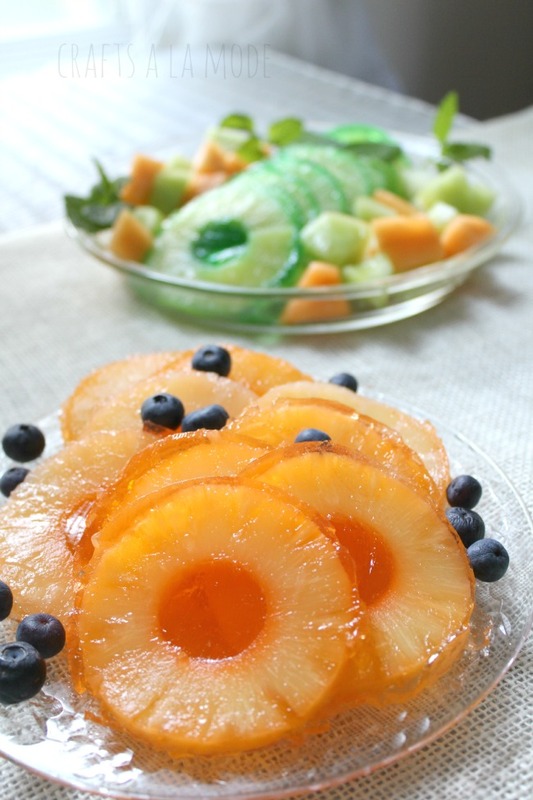 Once it's out and on a plate, simply slice with a knife to separate each separate pineapple slice which will be surrounded by Jello and will have a really pretty Jello center, too. Here's the one with lime Jello. I used a knife to cut apart the slices. Here's the orange jel. Initially, I put them in plates with fruit all around and then I decided to make a really cute plate with just 2 slices. Hope you like this and it's got a cute theme also. Everyone will want to know HOW YOU MADE THESE!! Easy easy easy. Have a great week, people... being creative. 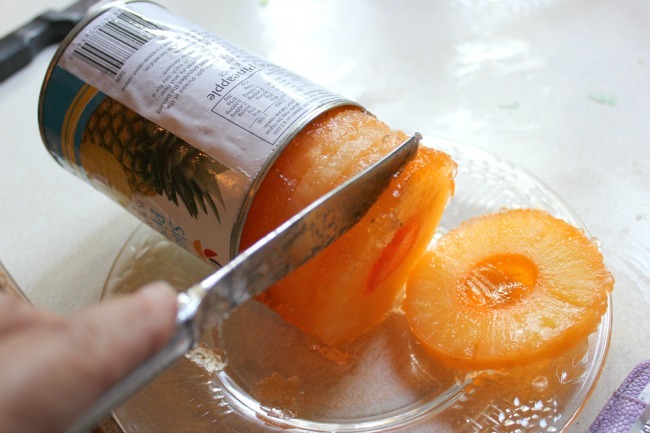 This looks pretty and easy, and I love pineapple! Ooh my kids would love this. A great example of a good gelatin mold.Thanks for sharing on Let's Get Real (I'm co-hosting this week)!